With twenty-two years of executive, technical and training experience in the landscape and snow-ice maintenance industry, Ryan is well-known in the profession both locally and nationally. Ryan is an avid golfer and proud father of three young children. As a result of thirty-eight years in medical device executive management, Paulita is skilled in new business development, marketing, strategic planning and ISO certification. Paulita serves on several boards and enjoys ornithology and gardening. Colin O’Neill founded Prescription Landscape Inc in 1980. The name was rooted in Colin’s horticulture degree and his vision for healthy land management practices. Enlisting Michael Teichert as a partner one year later, the two officially embarked on building a business enterprise. With their attention to detailed service and budget conscious buyers, Colin and Mike attracted commercial property managers. They led industry standards for good paying jobs with benefits and ethical land and water practices. Prescription Landscape grew steadily in the St. Paul market, the site of the first business campus. The company is now a three-branch operation serving the entire metro from St. Paul, Crystal and Shakopee locations. In 2003, Colin hired Ryan Foudray and in 2012, Mike Teichert retired and Ryan became CEO/COO and partner. Colin continued as Prescription’s managing partner and finance and business consultant but, in pursuit of his boating passion, Colin moved to Fernandina Beach, Florida. Quite unexpectedly, Colin was diagnosed with an extremely rare and untreatable gallbladder cancer in December 2015 and died in April 2016. Ryan formed a business partnership with Colin’s spouse, Paulita LaPlante, and together they are carrying on Prescription Landscape’s uniquely Minnesota legacy of industry professionalism, employee engagement and environmental stewardship. Their first step in this process was to develop new strategic plans focused on expanding service lines and growing the core business. As a result, they acquired the outdoor services division from Arteka Companies in June 2017. The brand being respected across the metro,this seasoned team continues to operate as Arteka Outdoor Services, a division of Prescription Landscape. One year later, Ryan and Paulita hired the senior leadership of Arteka’s landscape construction business. With this expansion, Prescription Landscape now offers clients a complete menu of commercial landscape services from project design and installation to property landscape, maintenance and snow-ice management services. This bolsters Prescription Landscape's ability to serve a larger range of clients, including construction companies involved in new commercial real estate development in the Twin Cities and Upper Midwest. 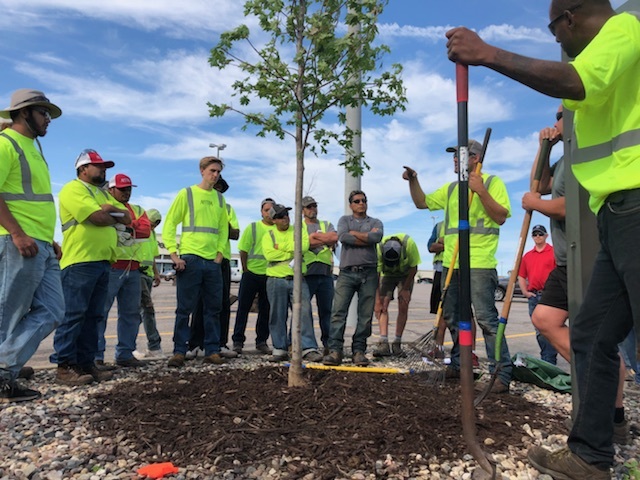 With continued growth in their plans, Paulita and Ryan are working to build a bright future for their employees and the landscape management and construction industry in Minnesota.